To be entirely fair, I was not sure if this book would be my thing. The teens on the run aspect didn't really appeal to me, but Nobody But Us was blurbed by two of my favorite authors (Courtney Summers and Kody Keplinger), as well as being compared to If I Stay by Gayle Forman, which I loved. I thought perhaps instead of being melodramatic, Nobody But Us might have the contemplative, deep, emotionally fraught style of If I Stay. Well, I've been wrong before. I really need to stop buying into this marketing that sells you one book by comparing it to another. Starting with the good, Halbrook writes well, creating two different voices for Zoe and Will. They think differently and have wholly different vocabulary. Multiple points of view in first person are tricky, so I applaud her for doing that this well. The writing's a bit simpler than I personally tend to prefer, and includes the occasional odd word choice, like "vessel" to refer to a car, though that seems like something that my be caught before publication. On the whole, I have no real complaints about the writing though. I would like to propose changing the tagline to "They're young. They're stupid. They're on the run." That pretty much sums up this book for me. Will, eighteen and finally free of the system where he's bounced from home to home and school to school, decides to take his girlfriend Zoe with him away from their terrible hometown and her abusive father. Fifteen-year-old Zoe needs a change, no doubt about that. Her father is a drunken monster, and should be in jail, but that does not mean that running away with Will is an awesome plan. In fact, it's pretty much the opposite of an awesome plan. Worse, I have no doubt that, given time, he would end up hitting Zoe. Their interactions had warning bells chiming in my head constantly. He thinks constantly about how much he wants to make her happy, but snaps at her any time she annoys him. He swears at her, even though he knows how much that upsets her. After some guys hit on her, he accuses her of flirting with them, blaming her, though she was only a victim of their rude behavior. When he does things like this, she accuses herself for his unhappiness, for their bad situation, even though she's clearly not at fault for any of it. Their relationship is incredibly unhealthy and I don't feel like Halbrook made her stance on that as a bad thing clear at all. What I wanted and expected was an emotionally hard-hitting novel about the horrors of abuse, but instead I found a melodramatic mess that romanticizes what I see as an abusive relationship. The whole thing read like a Lifetime original movie. I imagine many people will enjoy this, given how popular books with similar themes have been recently, but it was not for me in the slightest. I have to say I am not really sure how I feel about this book. I have a bit of a love hate relationship with it I guess you could say. I am just left very undecided. I did find myself wanting to keep reading and see what happened. I was curious as to where the story would head. However I really did not find myself having a connection with the characters like I usually do and I really can't pinpoint why. Not that I didn't care what would happen to them because I obviously did hence the reason I kept reading. I will definitely read other things Kristin Halbrook writes. It think her writing is great. We find out so much about the characters Will and Zoe and their traumatic pasts. It is a heartbreaking story of two teenagers who are on the run from their past and along the way they make many mistakes. Their ultimate goal is to have a better life together. Will is in a group home and Zoe is abused by her father and her mother passed away. They go on the run trying to reach Vegas and start a life together. I had a bit of a problem with this seeing as Zoe is 15 and Will is 18. Will has the best intentions to get her away from her abusive father, show her what love really is and take care of her. He just doesn't seem to go about it the right way. I really was much more into it during the second half of the book. The ups and downs these two go through were heartbreaking. The ending was a huge shock to me. I really did not see it going that way!! If anything I would recommend you read this book just for the shock the ending will give you. All in all it was a quick, heartbreaking, good read with a few flaws. But nothing that I couldn't overlook or that stopped me from wondering and speculating what would happen next. 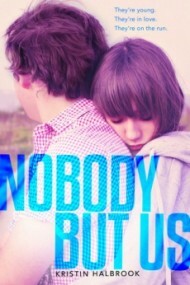 I immediately knew I wanted to read Nobody But Us. It sounded like one of those heart breaking, gut wrenching stories that I love so much. I was also hoping on shedding some tears. Well, this book is sad, but I didn’t cry. In fact, the end left me feeling confused. I read this straight through in one afternoon, so I did enjoy it. It had me hooked from the beginning, but I’m still not sure how I feel about the ending and the book as a whole. The story follows Zoe and Will, two very damaged teenagers who are in love and want to get away from their lives. Will just turned 18, so he’s been kicked out of his group home. He’s leaving and he takes his 15 year old girlfriend with him, since she’s abused by her alcoholic father. They’re excited to run away together and be free, but Will also spends their whole trip paranoid about the past catching up with him. He’s made some awful mistakes, and makes even bigger ones once they’ve crossed a few state lines. I had this horrible feeling the entire time I was reading. I knew something awful was going to happen. Then about half way through, things appeared to be looking up. I started feeling hopeful right along with Zoe and Will. Then things take a turn for the worse. It was clear from the beginning that their story could not end well, but I didn’t want things to go the way they did. I was actually mad at Zoe near the end. I know she does the right thing, but I was so emotionally invested in these two, that I couldn’t believe what happened. At the end I was mad, confused, and sad. I expected a bad ending, but not what actually happened. It was shocking, but also unsatisfying. It seemed like a shock ending for the sake of a shock ending. There is a hint of hope at the end, so that’s good. I just wanted something more out this book, but I didn’t get it. It’s still a worthwhile read though. This book started fine, things started to happen straight away. The plot line was different from most books. The way it switched between Will and Zoes’ perspective, kept me entertained. The characters were raw and heart wrenching. You really wanted for them to have that happy ending, but they didn’t and that really ruined it for me. I just don’t want to read a book were it ends like that. I JUST DON’T. I have nothing against a good cry however that went over into bad crying territory. When I finished I kept thinking over and over HOW COULD THIS HAPPEN!?!? WHY WOULD KRISTIN HALBROOK LET THE STORY END LIKE THIS!?!? So if you don’t mind a tragic ending then you’ll probably like this but if not BE WARNED. I really wish I hadn't seen any reviews for Nobody But Us before reading because I feel like they were all just sitting in the back of my mind poking at the story while I was reading. Still, I did end up enjoying it. I did not, in fact, really like either Will or Zoe, but I could appreciate their characters. They were supposed to make bad choices and be caught up in each other. I was so torn while reading because on the one hand, I know what new love feels like and that Zoe and Will's was multiplied by their terrible home lives taking it to an even more obsessive level, but on the other hand, I just wanted to take them both aside and slap some sense into them. It wasn't even just the spiral of terrible choices; I wanted them to see the poisons in their relationship as well. The setting was perfect. I couldn't imagine a better way for this downward spiral of a relationship to play out. Usually when you think 'road trip' happy, carefree thoughts come to mind. That's definitely not what Nobody But Us was about, yet I still loved it. I think the excitement of being on the run really adds something important. The Nutshell: Nobody But Us isn't my usual read because I usually stick to the fluffy stuff, but I'm glad I gave it a chance since I ended up really enjoying it. If you're looking for a quick read about two teens running away from everything while clinging to each other then you should read Nobody But Us. This book was nothing like I expected it to be. Sad thing is, I'm not sure how I feel about that. Even more sad than that, this was one of my most anticipated reads of 2013. My expectations for this were so high, but they barely reached the bar. Zoe is a fifteen year old girl who is left by herself with a drunken, abusive father. Will is an eighteen year old boy who has been in foster care almost his entire life. Together they found solace. They realize that the only way they can live peacefully is together, without anyone else around. So they take off on their own for a chance to survive. Sounds amazing right? Unfortunately, this book moved super slow for me. But, I was intrigued so I kept reading. Finally at about the last 20 pages or so, it picked up. If the rest of the book had been like the last 20 pages, I would have enjoyed this so much more. Before then it seemed like everything happened just so the plot could move. But finally, the action picked up. The writing made it seem like what was being written was actually going on. And the emotion in it was incredible. Now the emotion was the only thing really tying me to the book. I wanted to know every move that Will made because he was so emotionally driven. He may not have been the smartest, but everything he did had some type of feeling behind it and that's what caused him to do it. The number one thing was his love for Zoe. Now Zoe, she was the logical thinker of the two. She was the one that was driven by her mind and not her heart. I'm not sure why, but I didn't connect with her as much as Will. I just felt a little distant from her. I'm thinking it was because although she was the thinker in the situation, she still went back and forth in her decisions. But I will say this wasn't the easiest of situations to deal with so she deserved to be a little conflicted. As for the romance man Will is totally swoon worthy. (Minus all the other stuff....) His love for Zoe is unwavering. Through everything, throughout the entire book he showed his love for her. As I said he was the one that really thought with his emotions, so it came off as a little intense, but it was just the way he was. Now her love for him was different. It was obvious she loved him too, but since she was the logical one, every time she tried to show it, she showed it a little different. It didn't seem as deep as it was for Will. But that's only because she wasn't as comfortable showing her emotions as he was. Although my expectations were not met, I was still able to enjoy this. I could see why Halbrook chose to do certain things and why she left certain things out, even if I did not agree with them. Fast paced contemporary that will break your heart. Nobody But Us is one of those gripping, darkly beautiful gritty books that I could not look away from, and as the story continued, I knew it was going to break my heart but I still couldn't look away. I sympathized with Zoe, and could totally see the appeal of Will. It was finally someone who wanted to protect her after a lifetime of her abusive father. It broke my heart to hear what she went through in silence with him as well as her memories of her mom. It was quite a journey to watch Zoe learn more about herself and life in this book, and I hated that she had to continue down the road of hard knocks. I think that she grew so much though, and however hard the decisions she had to make, I still was rooting for her to do the right thing no matter how much it hurt, and ultimately make the choice of following her heart no matter the cost. This is in no way a light and fluffy read, and the ending really reflected that. It shocked me, and like I said earlier, it broke my heart. Kristin Halbrook wrote a story with an end in mind, and I applaud her in writing it and sharing this story. I also tip my hat because even though I somehow wanted Will and Zoe to succeed because I cared about them and wished that they could have their happy ending, I also knew that bad decisions meant consequences, and you can't run from those forever. It is hard to have me torn like that, and Nobody But Us succeeded. Bottom Line: Fast paced contemporary that will break your heart.